With all the money that pours into superhero movies, you’d think someone would hire a script doctor. If an impartial eye had been trained on the shooting script for The Amazing Spider-Man 2, it might’ve been noticed that there are three stories at play here — and they don’t really come together in a meaningful way. The best part of this Spider-Man concerns Spidey (Andrew Garfield) doing battle with the villain Electro (Jamie Foxx). The worst, told partially in flashback, follows our hero’s quest to learn more about his deceased parents. Floating somewhere in the middle is a dual subplot about romantic interest Gwen Stacy (Emma Stone) and the ailing, billionaire heir Harry Osborn (Dane DeHaan). If it sounds like a mess, keep in mind that we’re trying to build a franchise here. With no less than four movies in the works, we’ve gotta plant a lot of seeds, don’t we? While that approach is good for branding, it’s pretty rough on enjoyability. 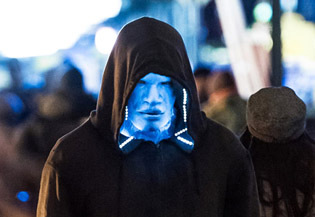 Peter Parker’s combat with Electro, in isolation, would’ve made for a comic action flick that measures up with the best in the genre; several of the scenes between the two are captivating and energizing, and the baddie’s backstory has just the right amount of comic nonsense. And although the Harry Osborn business felt the most tacked-on, it carried the promise of an exciting (and properly motivated) challenge in the upcoming Amazing Spider-Man 3 — which already has a release date of June 10, 2016, so mark your calendars. As for the rest, the web slinger’s background and family life was exhaustively explored in the previous Spider-Man trilogy (and even more thoroughly run into the ground in the first chapter of this go-round). As for Gwen Stacy, she’s given convincing life by Stone; it’s too bad that Garfield, who seems to struggle in this chapter, can’t sell the relationship.